It’s beginning to snow again just now and oh, man, I am so done with this winter. We’ve spent yesterday visiting parents and the weather and climate is just such a stark contrast! It is a bit depressing returning to snow after sunbathing and picking up wild garlic while walking the dog. There is a white blanket still persisting in the garden, but indoors, I am already sprouting, because I just can’t wait for the next gardening season… and the first home-grown strawberries. We just LOVE them. Alas, while we wait for the weather to improve and get ready to shovel the snow again, my kitchen is in full spring mode! Breakfast this morning? 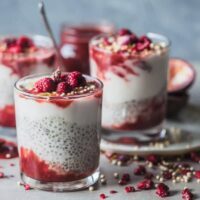 This absolutely gorgeous Strawberry Coconut Chia Pudding, that is rich in omega3 and healthy fats, perfect to get you started on a bleak Monday morning. 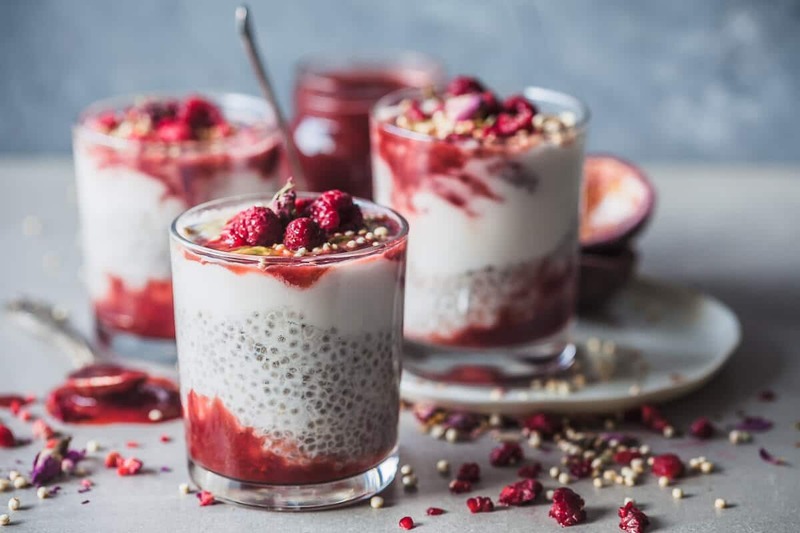 This Coconut Chia Pudding is made with just a couple of ingredients: almond milk, coconut milk, chia seeds and vanilla for the base. Because it’s winter, we used frozen strawberries to make a quick strawberry jam (that keeps refrigerated for up to a week), and then topped with some almond butter, more strawberry jam and some frozen berries. Because simple food is the best food! 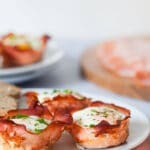 And if you are lazy in the morning, or just don’t have any time in the morning rush, you can easily prepare this breakfast ahead, store in an air-tight container and consume on the go! 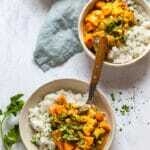 Great idea for your weekly meal-prep as well! 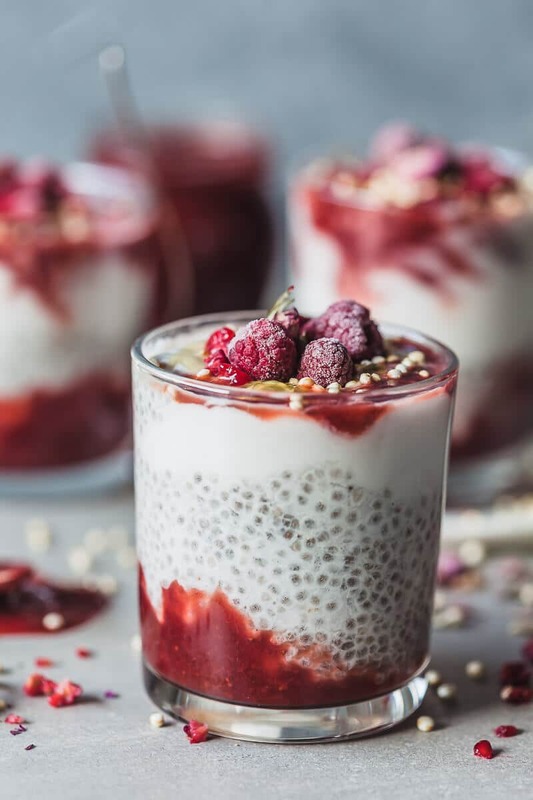 Combine chia seeds, almond milk and vanilla in a jar or container. Stir and refrigerate overnight. In the morning, remove from fridge. Prepare your strawberry jam: in a pan, place frozen strawberries and coconut sugar and cook on low for about 15 minutes. Let the strawberries melt and cook down. Then, with an immersion blender blend the jam smooth and continue cooking for a couple of minutes, until it thickens. You can store any leftover jam in the fridge for up to a week. Open a can of coconut milk and skim the solid cream. Save the leftover coconut water for drinking or smoothies. 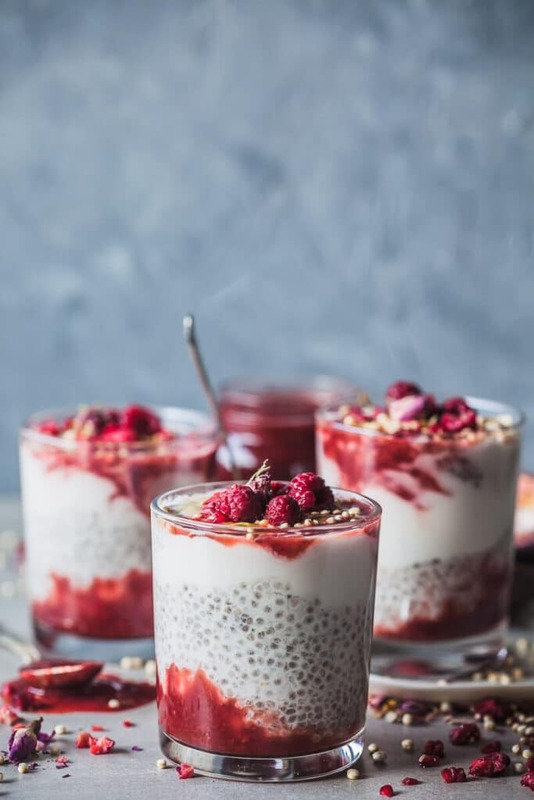 If your chia pudding is too thick, stir in a spoonful of coconut milk or coconut water. Whisk the thick coconut milk (cream). 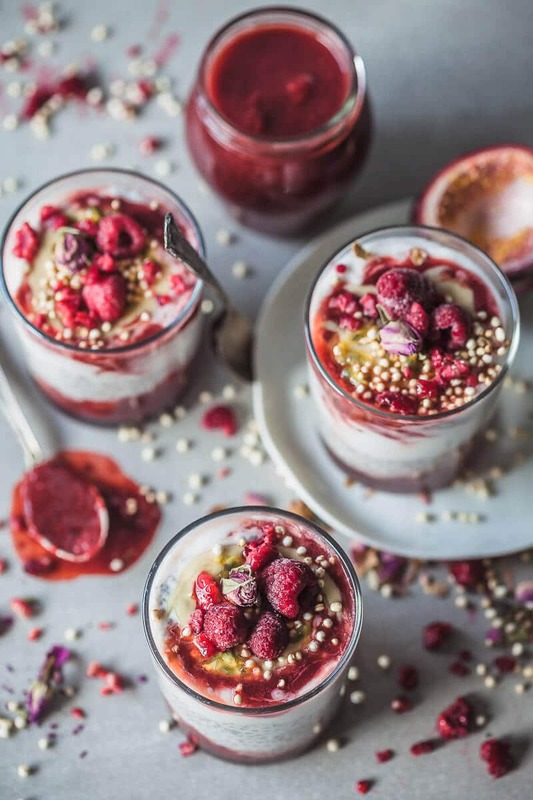 Layer your pudding in jars or glassed: start with a layer of strawberry jam, add a layer of chia pudding and top with a layer of coconut milk. Repeat until you use up the ingredients. Top with some strawberry jam and berries (fresh or frozen). 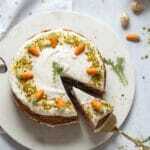 Optionally, add a teaspoon of almond butter, some quinoa puffs and passion fruit. Serve. 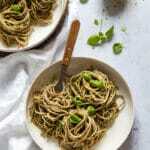 Blog update news: we’re adding nutritional values to our recipes! New recipes are coming with nutrition data, and we’ll try to update the older recipes as fast as we can. 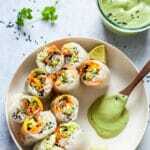 Hope this will help with your nutrition goals. This looks amazing! I never tried the combo of strawberry and coconut but sounds tasty! You should try it, it tastes great together!